My involvement began in late 1963 when I was assigned to a team at Hughes Aircraft, that had been given the task of developing satellite communications applications. Syncom 2 was in orbit and the age of satellite communication had begun. As the junior member of the team, I was assigned mobile applications. A brief study of the problem indicated that for truly mobile communications the user should be able to make use of a simple dipole antenna (or aircraft blade antenna) and that the optimum frequency would be in the 150 MHz to 450 MHz range. The telemetry and command system of Syncom 2 operated in the VHF band at 136 MHz and 148 MHz this led to the proposal to use this spacecraft to demonstrate satellite to aircraft communications. This document describes the efforts by personnel at Hughes, NASA, Air Transport Association, Bendix, Pan Am as well as the FAA and the US Weather Bureau. Significant early contributors were Frank White (ATA), William Pulford and Harry Betsill (Bendix), Meredith Eick, Lou Greenbaum and Roland Boucher (Hughes), Ben McLeod, Bob Bohanon and Waldo Lynch (Pan Am), Pat Corrigan and Bob Darcy (NASA Goddard) and members of the antenna department at Boeing. Many other organizations were to become involved over the next nine years. 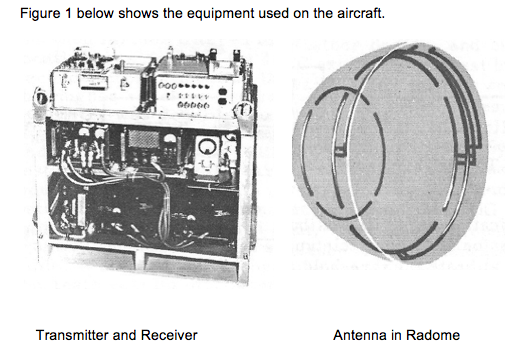 In early 1964, a simple test program was initiated to obtain first-hand information on the properties of VHF satellite communication. On 21 February, the one-half watt Syncom 2 VHF telemetry signal was successfully received on a dipole antenna, thus demonstrating the successful reception of very weak (-142 dbm) signals by a standard telemetry receiver. On 8 May 1964, the first teletype message was repeated through Syncom 2 at VHF frequencies, the ground transmitter had a power of 19 watts and the receiver a noise figure of 3.5-db, transmitter and receiver antennas were 12 and 14-db Yagi’s. During the interval between these tests, two Boeing engineers received Syncom 2 telemetry while gliding over Puget Sound in a light aircraft (Aeronca Champion). News of these tests reached the airline community, Frank White of the Air Transport Association set in motion a series of events, which eventually led to the ATS-1 VHF experiment on 27 July 1964. Mr. White called the kickoff meeting of what he called The Interim Communication Satellite Committee. representatives of the Air Transport Association, FCC, FAA, NASA, Pan American World Airways, Bendix Radio, Boeing Aircraft, Comsat, and Hughes participated. Mr. White’s plan was simple — demonstrate two-way digital communications between a Pan American jet aircraft in commercial service over the Pacific Ocean and the NASA-Hughes ground terminal at Camp Roberts California via the Syncom 3 satellite. The program moved swiftly. On 19 August, 3 weeks after the program began, a modified Bendix aircraft receiver picked up the Syncom 3 telemetry signal as the spacecraft rose from Cape Kennedy in the first successful launch of a geostationary satellite. On 21 September, 5 weeks later, the Syncom 3 telemetry was received aboard a PAA Boeing 707 enroute from San Francisco to Honolulu. The first digital message transmitted from a synchronous satellite to a commercial aircraft was demonstrated on that day. On 27 January, exactly 6 months from the beginning of this ambitious program, the first two-way digital communication link between a ground station and aircraft via a synchronous satellite was established. The first flight test took place over the Pacific Ocean in a Pan AM 707 aircraft. Those on board were Waldo Lynch a vice president of Pan American Airways, engineers Harry Betsill and Bill Pulford of Bendix Radio, and Roland Boucher of Hughes. Operational tests were conducted that day during a flight from San Francisco to Honolulu, Harry Betsill remained on board conducting 3 hours of two-way communications between the aircraft and the NASA ground station at Camp Roberts California. NASA at both its Australian and Alaskan tracking stations monitored these transmissions. The aircraft with Harry continued on to Hong Kong. On the return flight, it transmitted nearly perfect teletype copy at 60 wpm to the Camp Roberts terminal. The success of this test program and the potential it demonstrated for mobile satellite communications led to the decision by NASA to Fund the first VHF repeater experiment on the ATS satellite. Within weeks of the test of January 27 NASA asked Hughes to develop a VHF repeater experiment for the NASA/Hughes Advanced Technology Satellite ATS-1. This experiment was managed by at first Bill Penprase then by Roland Boucher at Hughes. Pat Corrigan at the Goddard Spaceflight center was NASA program manager. I am sorry that I am quite fuzzy about events at this time. When returning home from the flight tests on January 28, I was told that my father had contacted meningitis at his home in Connecticut. He died after a brief illness. The next event, which I really remember, was the solution to an ATS antenna temperature problem.